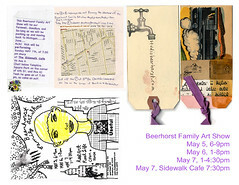 The Beerhorst Family Spring Art Show has come and gone. The highlite was being able to sit around the kitchen table with our friends Ivona and Summer and just talk with no one in a hurry to go any where sunday afternoon. There is something magical about getting the house all cleaned up with art carefully arranged on the walls and then a few friends over and some food to nibble on. Our shows always come with a fair amount of fretting about whether anyone will actually come and will we sell anything but we are allways rewarded in some way in the midst of it some where. Following the creative trail as it twists and turns and then sharing your creations with what friends can find the time to come across our threshold, this is again the place we made possilbe this past week end. And now it is monday morning and time to do the laundry.